Well, the lab course I've been tutoring reached the point yesterday that I'd been waiting for ever since I found out I'd be tutoring it - I've now seen my first tardigrades! I covered the generalities of tardigrades last year, but as I've noted before, there is nothing to compare with seeing an organism that you've previously only known from the literature in real life. And I have to say - tardigrades are just as adorable as I'd always imagined them to be. If not more so. Many tardigrades store their eggs underneath the cuticle, then shed them along with the cuticle when moulting. 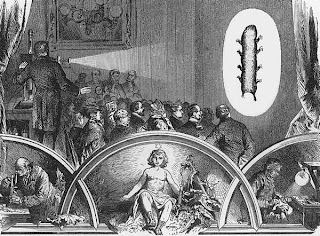 This photo by William West, from here, shows a specimen of Milnesium tardigradum in the act of doing so. While I couldn't tell you exactly what species they were, but they looked much like the photo (from here) at the top of this post. Little sausage-shaped animals with four pairs of little stumpy legs, on which they bumbled about in a decidedly endearing manner. I wasn't the only person impressed, either - I heard more than one student exclaiming aloud how cute they were when they looked down the microscope. When you've been trying a week previously to encourage enthusiasm in students about nematodes, it's certainly nice to have an organism that pretty much sells itself. If you'd like to see your own tardigrades, collect some moss or lichen and sit it in a petri dish with some water (use distilled water or rainwater, not tap water). Leave it there for enough time for the tardigrades to become active and crawl out of the moss. (While they may be found in terrestrial habitats, tardigrades require at least a film of water to move in. If they dry out, they either die or enter a dormant resistant stage known as a tun.) After 3-24 hours, pipette some water out of the base of the dish (tardigrades don't swim, so they settle to the bottom) into another dish or watchglass. Place your pipetted sample under a stereo microscope, and you should be able to see the tardigrades crawling around on the bottom! 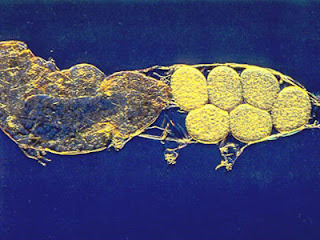 (As well as other small organisms such as rotifers, nematodes and possibly protozoa.) If you want a closer look, you can transfer a tardigrade onto a slide using a micropipette. A drop of alcohol added to the slide will knock the tardigrade out. Take a look at the Microbial Life page for more details. Please note the following mental and health risks: in some case addictive behaviour towards tardigrades has been noted. And, even worse, young people showed an increased interest in non-commercial, zoological and even philosophical topics. As a rule excited readers can be successfully calmed down by means of scholarly biology lectures, e.g. featuring the properties of allium cepa or the difference between mitosis and meiosis. Please note that it might be unwise to mention tardigrades in presence of those biology teachers who have never heard of them. We do not want to be held responsible for nervous breakdowns or any other possible consequences that might be caused by tardigrade abuse. Aren't they cute? Last time I went looking in my moss, I didn't find any. I'll try your method. "Please note that it might be unwise to mention tardigrades in presence of those biology teachers who have never heard of them." What's the minimum magnifying power you should look for in a stereo microscope? I'd like to have one but the mid-grade ones seem to start at $400. Sadly, I wouldn't be surprised. What's the minimum magnifying power you should look for in a stereo microscope? Depends entirely what you plan on looking at, of course. I was just using the university's bog-standard ones, which go up to 40x magnification. Personally, when I'm doing my research, I also use a 2x objective that doubles that magnification to 80x. 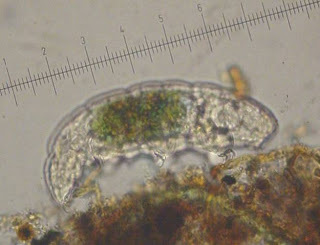 I've looked at several tardigrade images and I am a bit curious about the green mass in the gut. It looks like the choloroplasts are still intact and I wonder if they may still be operational and if thetardigrade may be getting energy photosynthetically while digesting the rest of the cell contents. On the way to endosymbiosis perhaps. I am an 11 year old who liked tardigrades. I've a;ways had fads where I became addicted to stuff, those include; tigers, lions, ants. dinosaurs, atoms, genetics, currently it's studying for the mcat while juggling a tardigrade love not like. This article is awesome!